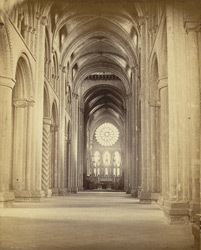 "The nave of this Cathedral, 240 feet in length, is formed by massy columns supporting circular arches, and is of Norman style of architecture. Many of its columns are ornamented, each opposite pair corresponding with one another, yet different from the others. Some are surrounded by spiral lines cut deeply into the solid stone, some are fluted in a vertical direction, while others are covered with lines running in opposite directions round the shafts. And not less interesting is the loftiness of its roof of stone, said to have been erected in 1240, which constitutes one of its distinguishing characteristics. In fact, the grand effect of the nave, with its aisles, is singularly impressive..."